... and occasionally tinking. It's coming along, though! This is where I'm at after an evening of knitting with a friend, a glass of wine, some homemade potato soup, and some chocolate. 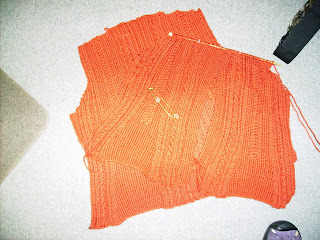 About 4 inches to go on the front pieces (I decided to knit them side by side, and I'll do the sleeves this way, too). I have to say that being someone who prefers mindless yards of stockinette, this pattern has really been a fun and easily memorized knit. I can't wait to wear it!